As a restaurant owner, you have your work cut out for you trying to get customers to visit your establishment. At Kachina Sign Center, we know that you only have a small window of opportunity to attract diners into your restaurant. We, therefore, have a wide range of signs that will help win over customers and have them dining at your venue. The key to making your restaurant known to prospective customers is to remain visible. For this reason, your sign should be seen at all times. We’ll design easels, sidewalk signs, business logos, and neon signs to ensure that you are visible at all times. We know that the setting of the sun doesn’t mark the end of a day in the restaurant world. Business extends into the night. That’s why we design LED signs for restaurants. LED lights will ensure that your business is visible at night, even when you close. Additionally, LED lights are brighter compared to traditional lights. And to top this off, they are still visible even in direct sunlight. Besides, you save on energy charges as they use up half the energy that standard neon signs do. Restaurant owners often have to work with the space they have, and windows are not spared. LED signs can be placed on windows to draw in customers at night. Wall graphics are also a great way to reach out to passersby. They are used to display what the restaurant has to offer in dishes and drinks. 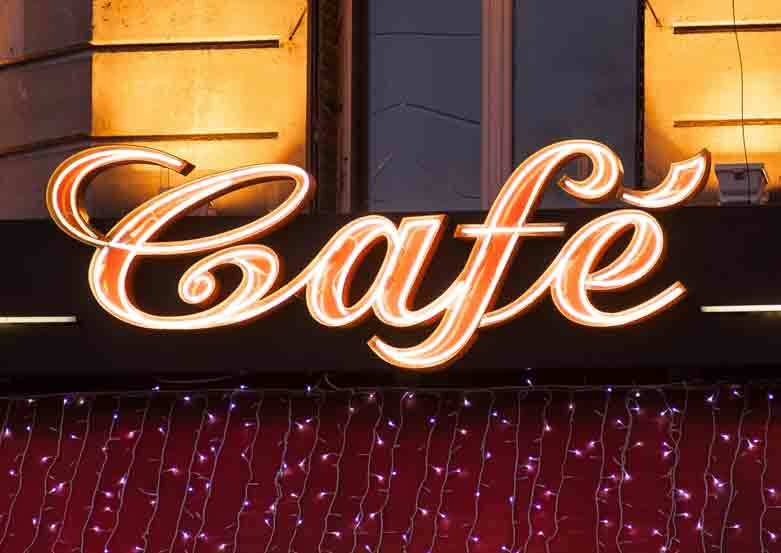 At times, you may have to make your sign tall and wide, primarily if your restaurant is located in a high-traffic area. This calls for a billboard, a roadside sign or even car top signs which grab the attention of hungry passersby. Furthermore, ensure you include simple directions to your restaurant. Our team of specialists at Kachina Sign Center will ensure that your business is up and running on signage matters. Do you want a menu board that displays the best dishes and drinks that you offer? We’ll design just the right menu board for your restaurant. Other signages that we deal in include A-frame store signs, awnings, window graphics, and aluminum signs.